It's difficult to generalize about the toxicity of oil spills to killer whales (Orcinus orca); however, we do know that oil exposure can cause external problems (such as skin or eye irritation or ulceration) and internal problems when oil is ingested or inhaled. Some research suggests that oil exposure can result in population-level impacts (Matkin et al. 2008). Evidence suggests that killer whales are unlikely to detect and avoid spilled oil. In the coastal waters of the Pacific Northwest, the southern resident killer whale population is listed as endangered under the U.S. Endangered Species Act and is also protected under the Marine Mammal Protection Act. Acoustic deterrent devices, which make sound not loud enough to cause pain but which is audible to marine mammals. Oikomi pipes, which are pipes made of reverberant metal that can deter or herd the whales. Boat traffic that provides noise and motion. Helicopters that generate considerable noise and wave movement at close range. Fire hoses that can direct streams of water at whales. Specific hazing methods, if any, recommended at the time of a spill will be those that have the greatest chance of success, depending on current conditions and information. Whether or not killer whales can be deterred from entering an oil spill is directly related to the degree to which the whales are attracted to an area. No one individual hazing technique will work in all situations. Unfortunately, hazing and monitoring activities are the only mitigation measures possible during an oil spill, as capture and rehabilitation of killer whales is improbable. The Northwest Wildlife Response Plan within the Northwest Area Contingency Plan (NWACP) includes response guidelines to protect killer whales (see NWACP Chapter 9970). 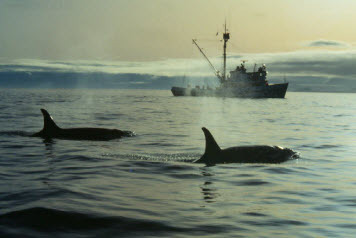 Supporting information to the 2016 NWACP, including contact information and more information on alternative marine mammal hazing techniques, can be found in the document, Supporting Information for the Killer Whale section of the Northwest Wildlife Response Plan, Chapter 9970 of the NWACP [PDF, 100 KB]. In addition, NOAA Fisheries has drafted an Implementation Plan [PDF, 346 KB] for hazing of Southern Resident killer whales, which provides guidance for whale monitoring and hazing activities as part of the NWACP. Matkin, C.O., Saulitis, E.L., Ellis, G.M., Olesiuk, P., Rice, S.D. 2008. Ongoing population-level impacts on killer whales Orcinus orca following the 'Exxon Valdez' oil spill in Prince William Sound, Alaska. Marine Ecology Progress Series, 356:269-281.